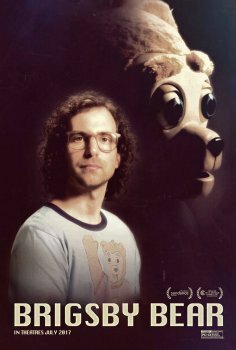 Brigsby Bear - Available as a download or stream? Brigsy Bear is about James and how his life totally changes when his favorite show, Brigsy Bear Adventures, ends. James has to face the real world but hangs on to his tv-show as support. It stars SNL's Kyle Mooney as well as Mark Hamill, Jane Adams and Greg Kinnear. It's directed by Dave McCary who has been a writer for SNL since 2013 and has directed many of their famous skits in the past. The movie has been called creative, admirable and scores a lot of points being an indie movie.